In an article on new scientist, the authors calculate that it takes .84 hectares (that’s over 2 acres!) of farmland to support a medium sized dog. Larger dogs like German Shepherds have a footprint of 1.1 hectares (2.7 acres) Through some calculations they then start comparing the impact of a dog to various cars, but that hinges on assigning energy production values to farmland, which in my opinion is the weak link in their calculation. So why not look at how dog ownership compares to the land required to feed a human being? You’ll remember from my post on the impact of everyone in NYC deciding tomorrow to buy only locally produced food that America has 1.5 acres of farmland per person and a human being can comfortably subsist on ~1/2 acre, assuming they don’t eat too much meat. Given that, owning a medium to large dog diverts enough land to comfortably feed 4-5 people. The main reason for the difference is that dogs are carnivores and must get most of their energy requirements from meat, with all the inherent energy inefficiency of meat production, while as omnivores we humans have can get any percentage of our diets, up to 100%, from directly from plants, cutting out the middleman and increasing efficiency. Horrifying? Yes. Should you have absolute faith in these numbers? Absolutely not. These are strictly back of the napkin calculations, some by me, some by the authors of the book who have a vested interest in being as shocking as possible to spur publicity and sales. For example, their breakdown of meat to plant energy for dogs came from the most popular brand of dog food in the UK, which probably contains more meat than absolutely necessary. Pet owners obviously want to buy food their pets will enjoy. In wealthy nations, pet food also probably makes use of kinds of meat that otherwise would simply be thrown away because it isn’t high quality enough to meet the standards of an affluent public. Similarly any table scraps feed to your dog that otherwise would go in the garbage are effectively free energy. Posted in: Feeding the world, Fun With Numbers. You’re right. The dog food they used in the study was more than a third dried meat, with the rest grains. But translating dried meat back to fresh weight gave them 50% more meat than grain. After work I should probably check if anyone has studied the maximum amount of a dogs diet that can healthily come from plant sources. 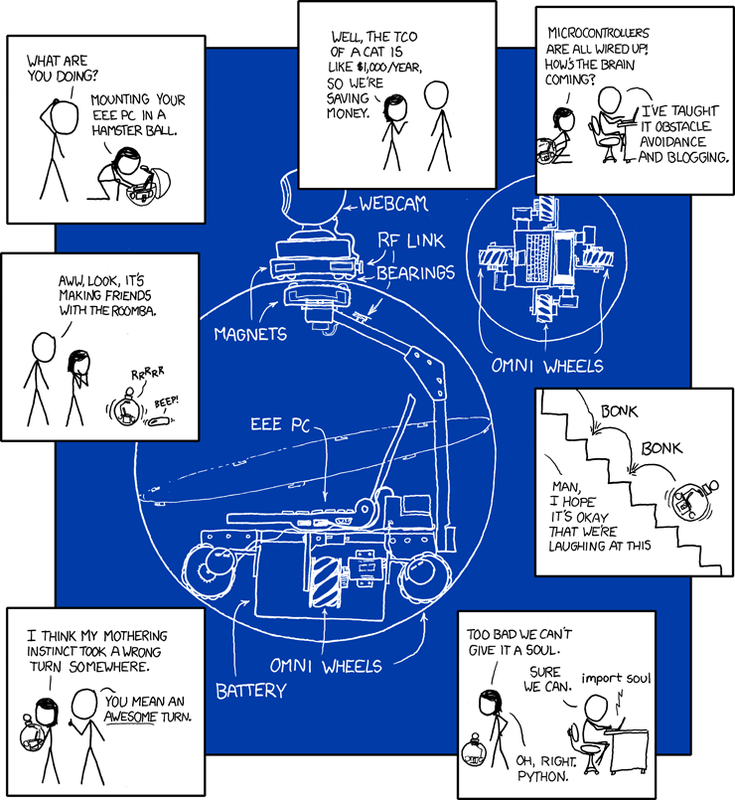 I wonder what the ecological impact of a robotic hamster ball is. I have no idea how to estimate the energy cost of fabricating a netbook and hamster ball, but netbooks typically run off of only a 30 watt powersupply and since that’s charging the battery while running the computer, we let’s assume a netbook in hamsterball could power both its computer (constant) and movement (intermittent) on an average of 30 watts 24 hours a day. That works out to 263 kilowatt-hours per year or ~1 gigajoule. Using the authors number of 135 gigajoules of energy per hectare (no idea how they came up with that), and .84 hectares for a medium sized dog, a netbook in hamster ball uses ~1% as much energy per year as a dog (although producing dogs is much more energy efficiently and are biodegradable when it comes to that.